Jeff Katz is a nationally recognized expert on issues of adoption and foster care. He has led workshops at national conferences, testified before Congress, and participated in adoption programs at the White House. His op-ed pieces have been published in the Washington Post, Boston Globe, San Diego Union-Tribune, Minneapolis Star Tribune, Christian Science Monitor, Milwaukee Journal Sentinel, Providence Journal, and many other publications. He’s also a regular contributor to the Huffington Post. For ten years, Jeff was the Executive Director of Adoption Rhode Island, an agency that recruits families to adopt children from Rhode Island’s child welfare system. In that role, he lead several important state and federal adoption initiatives. On the state level, he organized a successful campaign to rewrite Rhode Island’s laws on termination of parental rights. In 1996, Jeff worked closely with leaders in Rhode Island to organize “Families First,” a unique public-private partnership of leaders in government, business, human services and private philanthropy — all working together to promote the adoption of children from foster care. The Families First Leadership fr. left to right- Alan Hassenfeld, CEO of Hasbro Toys, Governor and Mrs. Lincoln Almond, Dave Thomas of Wendy's Restaurants, Dan Barry Adoption Rhode Island Board President, and Jeff Katz. On a national level, Jeff worked with national child welfare leaders in the 1995 campaign to prevent “block granting” of adoption and foster care, working closely with Senator John Chafee of Rhode Island, who cast the deciding vote that prevented the Senate from passing block grant legislation. In 1997, he worked closely with national adoption leaders and Senator Chafee to pass the Adoption and Safe Families Act, landmark reform based, in part, on Rhode Island’s reforms. In 1998, Jeff helped prevent passage of a regressive adoption tax credit that would have benefited affluent parents adopting babies at the expense of older, harder to place children. 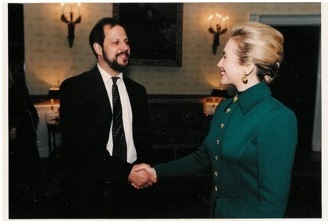 Jeff Katz with First Lady Hillary Clinton at the White House. Jeff has served on the Board of several national organizations including the National Adoption Center, the Adoption Exchange Association, and the Adoption Resource Exchange for Single Parents. In 1996, Jeff received an “Adoption Activist” award from the North American Council on Adoptable Children. As a Public Service Fellow, Jeff received a Masters Degree in Public Administration from the John F. Kennedy School of Government at Harvard University, where he developed the Listening to Parents Project. He also holds a Masters Degree in Social Work from Boston University.